Several representatives from our company will be in attendance for the duration of the event and look forward to catching up with everyone present. 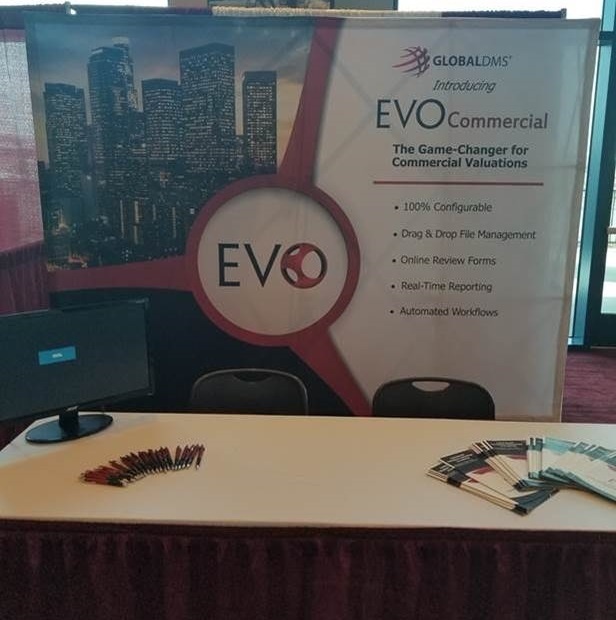 If you’re interested in learning how EVO-C can transform your commercial appraisal process through its configurable design and unique automation, stop by our table at any time for more details or to see a quick demo. Those interested in scheduling and one-on-one meetings with our team may still do so by submitting their request to marketing@globaldms.com. Specifically designed for commercial lenders needing a centralized platform, EVO-C revolutionizes their experience by providing custom solutions through unique configuration to their specific business processes. This ‘next generation’ management system is the first of its kind within the marketplace and the only commercial platform that can automate a user’s specific process without development intervention. EVO-C streamlines the commercial appraisal bidding process by providing an easy way to send RFPs to multiple vendors and receive bids electronically. In addition, the EVO-C Network removes the burden of managing vendors, as they will now register within the platform as their own entity and possess their own profiles. Lender-users can view and connect with these profiles as they see fit, while still being able to manage their unique vendor preferences – such as coverage area, fees, and notifications. In short, EVO-C transcends traditional architecture and usability patterns that were previously regarded as industry best practice – making it a truly innovative management platform. Not attending the conference? No problem! Contact us at any time via productinfo@globaldms.com.